Kurdish Iranian filmmaker Bahman Ghobadi grew up during the devastating Iran-Iraq War, which killed several of his relatives. After starting out in photograp hy, he began attracting attention in his twenties from his short documentary films about Kurdish life. After serving as Abbas Kiarostami’s assistant director on The Wind Will Carry Us (Bād Mā-ra- Khāhad Bord, 1997), he expanded the theme of one of his short documentary films, Life in Fog, to make his first feature film, A Time for Drunken Horses (Zamani Barayé Masti Asbha, 2000). 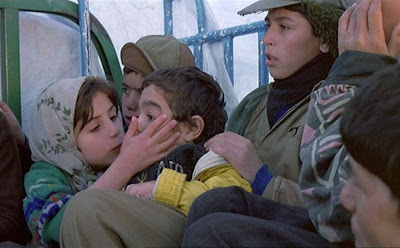 The film, about the harsh circumstances of an impoverished Kurdish family near the Iran-Iraq border where the local economy subsists around the dangerous smuggling trade, was an immediate sensation and multi-award winner, including the FIPRESCI critics prize and the Camera D’Or at the Cannes Film Festival. The Kurdish people live mostly in Kurdistan, a mountainous region of the Middle East that covers parts of Iran, Iraq, Syria, and Turkey. For them the national boundaries that separate their people are artifacts of past political processes that excluded their participation. But paradoxically these same artificial boundaries that close off free exchange have presented a secondary, though fraught with danger, economic opportunity: smuggling. A Time for Drunken Horses tells the story of an orphaned family trying to survive in these perilous conditions. The film was shot on location in the rugged mountains of Kurdistan with local, nonprofessional actors who were essentially playing themselves. Incredibly under these ro ugh production circumstances, the film displays remarkably high production values, with superb cinematography and well-executed camera setups that support smooth, dynamic editing. As a consequence, the visual narrative has a natural, gripping flow that maintains the continuity of the storyline and the dramatic developments. In fact the cinematography and narrative flow in this, Ghobadi’s first feature, are superior to those of his subsequent efforts, Marooned in Iraq (Gomgashtei Dar Aragh, 2002), Turtles Can Fly (Lakposhtha Parvaz Mikonand, 2004), and Half Moon (Niwemang, 2006). The story of A Time for Drunken Horses follows the fate of a family of young Iranian Kurds living near the Iraqi border. Ayoub is a twelve-year-old boy and the principal protagonist of the story. He has three sisters, Rojin, who is maybe about sixteen or seventeen, and Ameneh, who is perhaps eleven and who provides the narrative voice-over at the beginning and in certain other parts of the film, and a young toddler who stays at home and is barely seen in the film. Ayoub’s older brother, Madi, is fifteen and is a severely handicapped dwarf, with deformed legs and stunted arms. Despite their dangerously meager circumstances, the siblings are all extraordinarily close and loving towards each other, and this was evidently a Kurdish value that Ghobadi wanted to place in prominence. In particular, they all look after and try to amuse the crippled Madi, who requires constant care and medical attention. 1. Introduction (28 minutes). At the beginning of the film, Ayoub, Madi, and Ameneh are seen already working at odd jobs in a market town on the Iraqi side of the border. They do things like wrap consumer goods in newspaper for shipping on mule trains that will cross over the mountains into Iran. 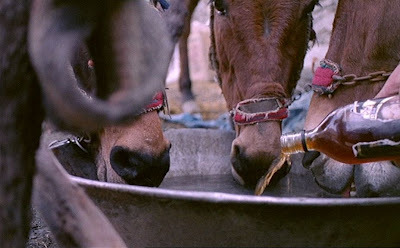 To manage the mules in the steep, icy mountain range, the herders have them drink vodka (hence the term “drunken horses”). It seems that most the goods shipped are part of the smuggling trade. Madi doesn’t work, but Ayoub and Ameneh apparently take him along with them so that he can see the hustle and bustle of the town. 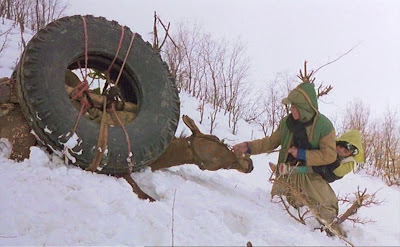 We learn that their mother had recently died in childbirth and that their father has the dangerous job of a smuggler who guides goods-laden mules over the treacherous mountains passes and must avoid landmines, border guards, and bandits. On their return to the Iranian side, the truckload of kid workers is stopped by the Iranian border guards, who abusively search the children. The viewer discovers that even taking blank school-exercise books into Iran is prohibited by the authorities. So their truck is impounded, and the kids have to walk the rest of the way back to their home village. When they get there, they discover that their father has been killed by a landmine explosion. Twelve-year-old Ayoub now has to drop out of school and be the family breadwinner. At this point Ayoub is also informed by a local doctor that Madi’s medical condition is terminal: he must have an emergency operation within four weeks, and in any case he can’t be expected to survive more than about eight months. 2. Ayoub Takes a Job (17 minutes). Ayoub manages to get a job as a porter, accompanying the smuggling mule train carrying mostly truck tires over th e snowy mountain pass. The work is tough, with porters are often getting cheated out of their fees and disputes leading to fistfights. Meanwhile Ameneh is diligently studying in school and learning about faraway things, like the wonders of airplanes. The ambivalent blessing to the Kurdish people of air power is a theme that will be picked up again in Ghobadi’s follow-up movie, Marooned in Iraq. After two months of backbreaking work, Ayoub still hasn’t made enough money for Madi’s operation, but he gets a break when his uncle breaks his arm and loans him his mule, which can draw better porter fees. However on his next trip over the pass with the mule, the team is ambushed by bandits, and the smugglers flee in panic. 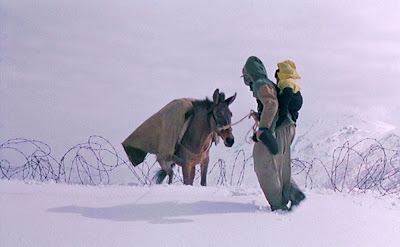 It is not clear in this scene whether Ayoub recovers his uncle's mule or not. 3. Rojin Gets Married. (18 minutes). Over Ayoub’s heated objections, the uncle arranges for Rojin to get married into a Iraqi Kurdish family. Rojin agrees to the match, because the groom’s family agrees to pay for Madi’s operation in Iraq. Again a passage over the mountains into Iraq ensues. But when they arrive, the family reneges on the deal and only offer a mule, instead. 4. Ayoub’s Mission for Madi (12 minutes). Without permission, Ayoub now takes Madi and the uncle’s mule on another mule train caravan over the mountain pass. The intention is to sell the mule in Iraq, where there is a better market for mules, and use the money for Madi’s operation. Again there is an ambush, and the caravan scatters, but Ayoub somehow recovers the mule and escapes with Madi. The final scene shows Ayoub and Madi making their way over the barbed-wire-marked border into Iraq. Their never-ending struggle continues. The final shot of the film, which holds for several seconds on the barren, barbed-wire borde r fence after Ayoub, Madi, and the mule have exited screen right, provides an abrupt ending that stirs reflection and lingers in the memory long afterwards. The grim, fatalistic determination of Ayoub in the face of overwhelming forces against him is reminiscent of the similarly hopelessly doomed closing of Andrzej Wajda’s Kanal (1957). In the face of a dark destiny, we can only admire those who go on, no matter what the odds. A significant theme that is always in the background of the film is the constant threat to human life from the widespread dispersal of landmines over all areas in this region. It contaminates farms, villages and wilderness areas with insidious "products of human civilization" that are designed to maim and kill civilians. The concern for landmines is picked up again in Ghobadi’s subsequent film, Turtles Can Fly. 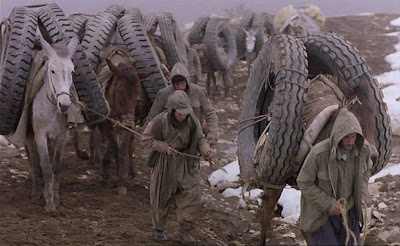 As already mentioned above, the cinematography in A Time for Drunken Horses is exceptional, especially for what must have been difficult shooting conditions in the Kurdish winter. I particularly liked Ghobadi’s use of short-focus photography (i.e. shooting images with a shallow depth-of-field), which highlights his subjects from their situated backgrounds. This was a technique also employed to excellent effect by Michelangelo Antonioni in his films. In addition the Kurdish music in the film effective: non-obtrusive but evocative. Kurdish music seems to be a personal passion for Ghobadi, and its presence is accentuated, and is even sometimes a major theme, in his later films. The pathetic and deformed figure of Madi is a key icon in this film. His utter helplessness and doomed condition provide a metaphor for a stunted and ultimately hopeless existence. And yet his family’s solicitousness and loving affection for him is extraordinary. Ayoub and Ameneh are constantly caressing him, buying him presents, and administering medicine to him at all times. This image of loving family bonding for a figure whom other people might pity but still shrink away from is a lasting one and a compelling tribute to Kurdish values. Ameneh and Madi are probably brother-and-sisters in real life, because they have the same last name, Ekhtiar-dini. Indeed there are five credited cast members in the film with that last name. 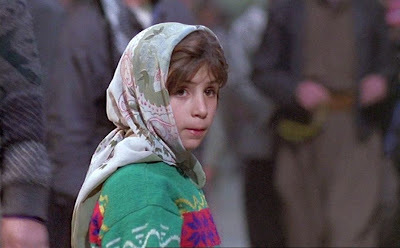 The appealing figure of Ameneh is also a key image in the film. She is the sympathetic, affectionate watcher, the representative of universal innocence that deserves a better and safer future. We can all relate to Ameneh’s plight and to this film.